The GT trim is the cheaper option, while the Sport trim offers many added features. 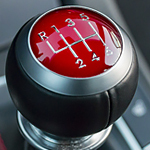 Both trim levels let you choose between an automatic or manual transmission. The standard transmission is cheaper, regardless of which trim level you choose. A 2.0-liter 4-cylinder engine powered the GT model, while a 1.6-liter 4-cylinder turbocharged engine gives the Sport trim a power boost. Larger front and rear brakes help the Sport trim stop quickly. 17-inch alloy rims come standard on the GT, while the Sport gets 18-inch alloy rims. The GT and Sport trim levels differ in many other ways. Visit Goshen Hyundai to check out both trim levels and take this sleek car for an exciting test drive.